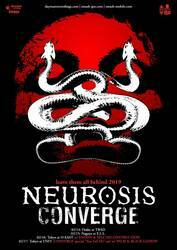 Neurosis will be touring Japan early next year in the recently announced Leave Them All Behind 2019 tour, where they will be joined by Converve. It's the group's first time in the country in six years. Neurosis just performed at Crucial Fest this month, and the band last released Fires Within Fires in 2016. For a trip down memory lane, here is a 1QI SPB did with the band back in 2013.